Why have Pitch Control on the TRV-005? Pitch Control not only allows for safe / fast ascents to the surface whereby the Pilot can fly the vehicle directly to the Launch / Recovery site in a vertical plane avoiding the vessels propellers etc. Pitch also allows quick viewing of points of interest directly below or above the vehicle without tilting the Cameras. Descents in a vertical plane from the surface to the job site are also expedited due to the Sonar detecting the Target long before the vehicle reaches the seabed enabling the Pilot to fly directly to the Target rather than the ‘norm’ of operations where the Pilot would reach bottom and then attempt to acquire the Target, possibly stirring up the seabed in the process. Why do the TRV-005 Primary Camera’s have fixed housings with internal Pan / Tilt? Having a dedicated Pan and Tilt mechanism with external Cameras installed will eventually lead to cable failure directly behind the Cameras. This is due to the constant flexing of the cables during Pan and Tilt operations. Dedicated housings with internal Pan and Tilts eliminate these external cable problems as the cables are held in a fixed position. If a cable were to fail within the fixed Pan and Tilt housing, this would be far easier and quicker to repair in the field. Why does the TRV-005 not use Fiber Optics for Data / Video? The main theory behind the TRV-005 design is ‘Simplicity’. Every component used on the TRV-005 has been carefully selected for reliability and ease of replacement in the field. Although Fiber Optics can be utilized in the TRV-005 system (as per Client spec), it is not an option that SSI would recommend due to the time, special equipment and experience required to repair in the field. The TRV-005 is designed to minimize down time should a component failure occur. Having Fiber Optics in the system not only adds to the complexity, but also increases the potential downtime. Why are there no Schematics of the Telemetry and Power Can in the Manual? Once again ‘Simplicity’ is the key. There are no field serviceable parts within the Telemetry or Power Cans. The TRV-005 system is provided with a complete Telemetry and Power Can as Spare which can replace the suspect unit onboard the vehicle while the suspected faulty unit is simply returned to SSI for repair / testing. Upon notification of a unit being returned to SSI for repair, an identical, fully tested and operational unit will be sent to the location immediately. Why does the TRV-005 have an Aluminum Chassis instead of the Polypropylene Frame which seems to be the Industry standard today?SSI believes in Stability for the Pilot. 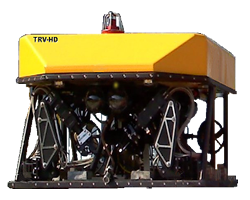 Video quality is primarily the end result of any Inspection / Survey vehicle. Having Mass minimizes any undulations on the vehicle, thereby providing a stable platform for excellent video images. 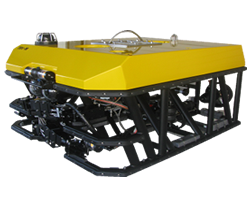 As a side note: The Poly frames can also severely cut ROV personnel during Launch and Recovery handling due to the Poly frame being cut into by hard Marine growth etc., creating sharp edges and protrusions which can lacerate individuals handling / working on the systems. SSI is proud to be part of the team searching for Amelia Earhart's plane. 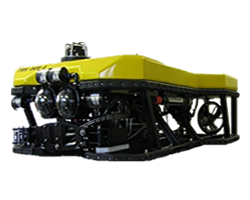 Copyright © 2018 Submersible Systems Inc | All rights reserved.